If you are serious about blogging, then you must have a measurement plan. No matter if you have just started and have only a dozen of visitors, or you already have a very popular blog whose primary purpose is making revenue from advertising. As long as you have some objectives for your blog, then you must decide what you need to measure. Why? Because this is the only way to understand your blog performance and whether you are successful or not for your readers (I assume you are not writing only for yourself!). Developing a measurement plan is the only way to understand whether you are successful or not for your readers. In this post I am going to draft a measurement plan for my blog and use it as a learning exercise to discuss critical aspects like choosing KPI's (Key Performance Indicators) and segments of analysis. Google Analytics will be my reference platform for implementing the measurement plan. Hence, developing a measurement plan for a blog require you to think more expansively and take these peculiarities into account. You should understand what really is an effective KPI to measure your performance, and consider any technical limitation you might encounter when implementing it on a web analytics tool. As an example, the way time on site is calculated in Google Analytics (and web analytics tools in general), should make you conclude that "Avg. Session Time" might not be the best metric to measure engagement of your blog readers. I wil touch this issue later and probably will reserve an entire new post to discuss in details other blog measurement issues. Let's go back to the objective of this post now. First of all, I am going to give a brief theoretical background about digital measurement, by illustrating the model developed by Avinash Kaushik. 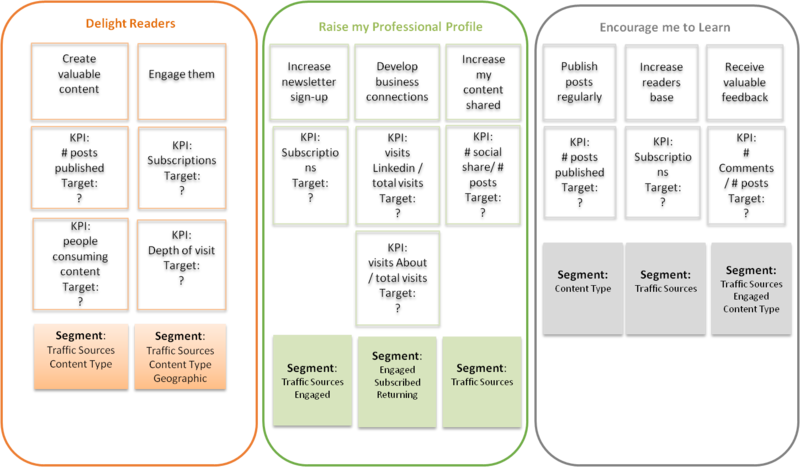 If you have not done it yet, read his inspiring post on developing a digital marketing measurement model. Once reviewed Avinash model, I will apply it to my blog, and also discuss some specific aspects to take into account when building a measurement plan for a blog. What Avinash recommends in his inspiring framework, is an HIERARCHICAL model with business objectives standing at the top and leading the other components of the model. The first step to create your digital measurement plan is to define your business objectives. You should ask yourself questions like: Why does my blog/website exist? What are the 3 most important priorities for my blog? Everything starts from declaring business objectives, or in other words, the mission of your blog. Hence, this is a very critical stage and you should dig really deep into your "digital motivations" in order to get it right. I think many analysts find this step a bit confusing. What Avinash means here, is identifying specific strategies that you will leverage to accomplish your business objectives. Let say your business objective in #Step1 was "Selling more products". #Step 2 will be the specicic strategies you will use to increase your sales, like: increasing the number of subscribers to your monthly promotion newsletter, reduce the abandonment rate in your checkout process, or increase the online engagement towards the content that is related to those products you aim to sell. Once defined business objectives and how you will intend to achieve them, the nest step is to choose Key Performance Indicators, also referred to as KPIs. A KPI is a metric that helps you understand how you are doing against your objectives. In other words, KPI's they are the numbers (METRIC == NUMBER) that you'll analyze daily to understand how your business is performing. For an objective such as selling products, great KPI's could be revenue, average order value or the average number of days/visits needed to make purchase. Avinash stresses on the importance of choosing a few (3 to 5 ideally) meaningful and actionable KPI's. To do so, a KPI should follow 4 rules: it should be uncomplex, relevant, timely, and instant useful. 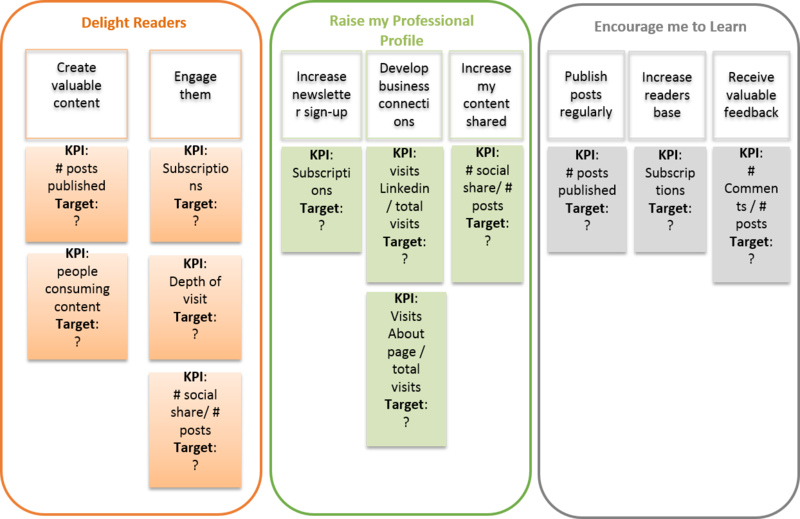 Nex you have to set targets for each of your KPI's. Targets are numerical values that you have pre-determined (with your business leadership, or simply by yourself in case you are the only one owner of the blog/website) as indicators of success or failure. You can create yearly targets, monthly, quarterly, etc. You decide it. In our example of sales, it could be "Target: Revenue = $125 per month". Finally, you should document which segments of data are important to measure for your business. You might want to analyse your KPI's by traffic channel (Organic vs Paid vs Direct, etc. ), by returning users, or by users who converted to a spefific goal you set in Google Analytics. It's up to you and to the nature of your business. What you have to remember, is that segmentation provides context to your data and it allows you to take action on your data. As Avinsh says..."Segment or die!". Let's walk through the measurement plan for my personal blog (if you want to familiarize with my blog objectives, here you can find a bit of background on how I started analyticsforfun.com). To accomplish objective 1 that is "Delight my Readers", I will need to create valuable content for my readers and engage them. To raise my professional profile (objective 2), I plan to execute 3 strategies: increase the number of people who subscribe to my newsletter, develop businees connections and also increase the number of posts shared over other social networks. Does it make sense so far? Finally, another important business objective of my blog is to encourage me to learn and gain more expertise. I am going to spend a few words on this, to make it clear. An important reason why I started this blog, and I am still investing on it, is to "speed up" my learning process in the analytics field. Behind each post I write, there is a research activity which include reading many other blogger posts, articles, etc. until I come up with an idea. Other times the idea comes directly from some projects I am currently working on and again I start doing research to gain more knowledge about the subject. Another very important role in blogging, is also played by planning all my blog activities, including writing. So to deliver on my last blog objective, I need to: first of all publish new posts on a regular basis, then increase my readers base (subscriptions is a great incentove to keep working on my blog) and finally receive valuable feedback (comments work like another great incentive). I hope my argument makes sense. I will provide a few more examples in next paragraph. Below are a list of potential KPI's I could use to measure my blog objectives. I've identified a total of 8 unique KPI's (note that some of them get repeated among different objectives and strategies). I am a bit over the 3 to 5 recommended earlier, but this just want to be an example from which you can get some ideas. To measure my ability to create valuable content, first of all I need to measure my effort in terms of number of posts published. To obtain success you first need to deserve it baby...Here the bad news: succcess for bloggers comes with lots of dedication and perseverance, and this means publishing great content regularly. Then, before looking at any other awesome metric offered by Google Analytics, you should look at your contribution as a blogger: are you publishing enough posts each month/week? (I am not, but you wait to answer after having set a target!). The next question I'd like to answer is whether people actually read my posts. Or, for some reasons, they just land to a page and leave it without even giving me a chance to show them what I have say. This is a very tricky user behaviour when it comes to measure it with Google Analytics as well as most web analytics tools. Especially for BLOGS, where readers might land to your blog just to consume your latest article and don't interact with any element of your page. Only 1 page consumed, no interactions with content, and Bounce Rate equal to 100%. Then what? How can you distinguish users who landed to your blog and left immediately (without reading any content) from readers who actually consumed some content? Tricky! The idea is to use some metrics that allow you to capture readers who actually consumed some content. Then you might say: "All right, people bounce on this post but most of them actually read the article (or some of it)" [Note: this does not mean we should not try to optimize the page. Bounce rate is still important measure and ideally the user should continue his/her journey through the blog by visiting other pages]. To measure content consumption, you will need a bit of coding to implement it in Google Analytics. I recommend you to check out the scroll tracking solutions suggested by Optimize Smart or the advanced content tracking post of Justin Cutroni. Both implementations, allow you to measure content consumption by tracking users scroll on your page (e.g. : just opened the page, 25% , 50%, 75% or 100% scroll which means the user has got to the end of your page, hurra!). The second strategy is engaging my readers. To measure it, the main KPI I use is the number of users who decided to subscribe to my posts and receive them directly into their email. I think that this is a superb measure of engagement, and I actually consider it a macro-conversion for my blog. To me, subscriptions means something like "Cool, I loved your blog...I don't want to miss any of your future posts, please drop me an email every time you will publish new content!" That's real engagement. And also a lot of joy for any blogger! Another solid metric I use to measure engagement is page depth. Page depth measures the distribution of the number of pages in each visit to my blog, during a given reporting period. In Google Analytics you can find this metric under Audience > Behaviour > Engagement. In the same Google Analytics report, you can also find his "sister metric": session duration. This is another good measure of engagement for websites, though for blogs is a bit less reliable since people often read only one post and do not click on a second page. Page depth is more solid metric in this sense. Let's move to second objective: raise my professional profile within the digital analytics community. First of all I need to increase the number of subscribers. Subscribers metric, here we go again! Secondly, I aim to develop business connections through my blog. In particular, I hope that people look at my Linkedin profile or perhaps learn more about my professional experience by entering the "About this Blog" page. I consider both of them signs of interest towards me as a professional in the digital analytics community. A good way to develop a KPI for this, it can be measuring the percentage of people looking into my Linkedin page (or About page) over the total visits. In Google Analytics, you can easily set this KPI as a GOAL, and automatically get a conversion rate for these type of readers. [Note: visiting my Linkedin connection does not imply building a new connection. Nevertheless, I consider it a demonstration of "professional" interest]. Another strategy I use to accomplish objective 2, is making people share my posts through social networks. My KPI here would be the percentage of posts shared over the total number of posts published at that time on the blog. This KPI is also referred to as "amplification rate". You could calculate this KPI separately for each social network or you might want to use an aggregate measure. All right we are almost done. My last - but not least - objective is to encourage me to learn. As I already said, having a blog for me works like an incentive to keep learning, come up with new ideas and ultimately gain more expertise in the analytics field. How can I accomplish this? Easy: first of all publishing more and more posts. KPI: number of posts published per month/week. But wait...am I just writing for myself? No. I need readers. I need to see them participating in my conversations. Readers will encourage me to write new content. It's kind of a VIRTUOUS CIRCLE. The more readers engage (subscribe) and participate (leave comments) to my blog, the more I will be motivated to write new content for them. My KPIs will be the number of subscribers and the percentage of people commenting over the total number of posts published. The second KPI is also referred to as conversation rate. An alternative way to measure conversation rate, might be the total number of words written in comments, divided by the total number of words I wrote on the post. If you have got till this point, great. Your measurement plan is almost complete, you have resolved the most "conceptual part" of the model. Now it's time to set a target for each your KPI's, so that you will be able to decide whether you were successful or not at blogging. Every company/organization sets some targets at the beginning of the year/trimester/etc. and decide where they aim the get at the end of the period. Why shouldn't you do the same for your blog? Targets add context to your data and allows you to understand where you are at the moment versus where you need to be. I have not included here my personal targets. use your web analytics benchmarking data, if they offer any (Google Analytics recently released a very interesting Benchmarking Report where you can compare your data with other similar industry/persoormance sites. There is also a category called "Blogging Resources and Services". If you want to learn more on how to set targets for your web analytics data, there is a fresh new post written by Avinash Kaushik on benchmarking performance. A segment can be defined as a group of people who have some attributes in common. Segments are a key part of your measurement plan because they allow you to take action on your data. For example, it's interesting to understand where most of my subscribers come from in terms of traffic channel. Or whether they tend to land to my blog to read a specific type of content (e.g. google analytics related posts) or not. - Traffic Sources: which traffic sources bring me quality traffic? Do engaged readers and subscribers tend to arrive from a speficic source or channel? - Geographic locations: the large majority of my readers come from US, but other countries (still generating relevant traffic) present a stronger engagement looking at the KPI's above. What can I do with this data? - Traffic Sources: again I want to understand where subscibers come from, whether there is a pattern. But I might also want to know traffic sources for those readers who share my content over social networks. - Engaged readers: here the idea is to analyse those readers who resulted engaged for my first objective. For example, I could create a GOAL in Google Analytics for readers who explore a minimum number of 3 pages within their visit. And classify them as CONVERTED. I will then use use this segment to analyse subscribers (are readers who convert, also more likely to subscribe to my posts?). And to analyse readers who demonstrate interest in building a business connection (do they tend to convert to my engagement goal first?). - Subscribed readers: are subscribed reader interested in building business connection with me? - Returning vs new readers: do users need to come back to demonstrate professional interest? How long does it take to mature a "lead"? - Content Type: how many posts am I publishing for each type of content? Am I receiving more comments when I write about web analytics or when I use R language to analyse data? - Traffic Sources: again, I would like to know where subscribers come from as well as readers who left cooments to my posts. - Engaged readers: this could be another way to analyse people who converted to my prior engagement goal. Do people need to engage (spend some significant time/visit a min number of pages) before leaving some comments? If so, can I take specific actions to improve engagement rate and encourage their participation? Ooh, that was quite a long post. I hope you found it of value and could use some of these ideas for developing your own blog measurement strategy. At this point, you should have clear the importance of establishing objectives and how to create a measurement plan from there. And you should have also got a sense of some critical measurement issues due to the unique nature of blogs. Measuring a blog needs you to think more extensively and consider important aspects such as content consumption and social sharing, that make blogs different from websites. A big benefit of setting up a measurement plan, is that reporting and data analysis activities will become much easier. You will now know what you need to look at, which KPI's and make decisions faster. Most of the KPI's I suggested in this post, can be easily measured with a basic implementation of Google Analytics (pageview tracking). Others require a bit of coding (like in the case of content consumption via page scrolling, social share buttons or comments). Others might need you to refer to your external tool data, like to measure the people who subscribed to your posts. The idea is to first produce a measurement plan, and next assess implementation on your web analytics tool. Pretty much everything can be implemented with Google Analytics. You might need some help from a technical person, but you are the owner of your plan and you know what is important for you. With Google Analytics you can also set goals for some of your KPI's. And if you like, you can also create a custom dashboard and monitor your KPI's/goals all in one place. That's about it. Please share your thoughts, critiques and feel free to suggest additional ideas, KPI's, segments we can use to develop a better plan for measuring blogs.